Spice boxes were an important piece of furniture in 18th century homes, as evidenced by the fact that they were usually placed in the parlour, the room with the most formal and elegant furniture. Originally used for the storage and safe keeping of spices in seventeenth and early 18th century England, spice boxes were a luxury item that was usually found in more prosperous homes of the day. Spice boxes were typically made with more expensive woods such as walnut, cherry, figured maple, and, as it became available, mahogany, and were made more like case furniture than other types of boxes of the period. Less expensive woods were used for structural and interior pieces, and the type of secondary wood used varied, depending on what was locally available. Many spice boxes were made from exotic woods and featured intricate inlay work and secret drawers, and thus the skill required to construct these boxes was considerable. Because of their prominent and visible location in the 18th century household, the spice box provided an excellent opportunity for the cabinetmaker to showcase his skill and expertise. The traditional interior design consisted of a central square drawer surrounded by a symmetrical pattern of drawers. The drawers were often a graduated pattern in later examples. Earlier forms also featured turned ball feet, while later forms often featured bracket and ogee bracket feet. 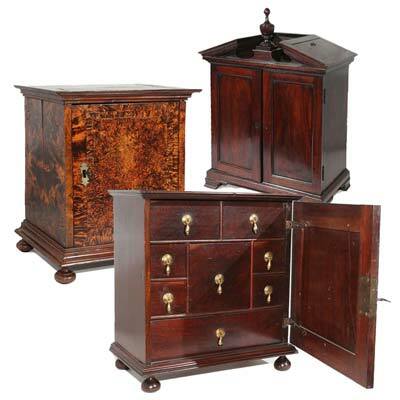 These stylistic changes are concurrent with a change in use, as late 18th century boxes were often used to store valuables and other important items rather than spices. Though the use of spice boxes had diminished in popularity by the later half of the 18th century in England and New England, they continued to be made and cherished in Pennsylvania, particularly the Delaware Valley. Because of the English heritage and conservative lifestyle of the people in this region, notably the Quakers, the spice box remained an important furnishing for more affluent households. The same care and superior craftsmanship were also evident in tea caddies of the same period, and the forms are in many ways similar in their use and importance. Since they both housed imported items that were of considerable expense at that time, it only made sense that the container itself be handsome and well made, and likely a piece the owner was quite proud of. Today, spice boxes are an interesting and attractive form of the fine craftsmanship of 17th and 18th cabinetmakers, are prized by collectors, and still make quite a statement in the modern household.